Please be informed that SME Association of Malaysia in collaboration with Institute for Information industry and SME Association of Klang cordially invites you to participate in the SME E-commerce & Innovation Workshop 2016 on 6th August, 2016. The two-day workshop is specially designed for SMEs who are interested in embarking on E-commerce and ICT. The workshop will impart essential knowledge, know-how and skills on running (cross-border) e-commerce, the application of ICT in business, and examines the success cases of SMEs in adopting e-commerce for business expansion. 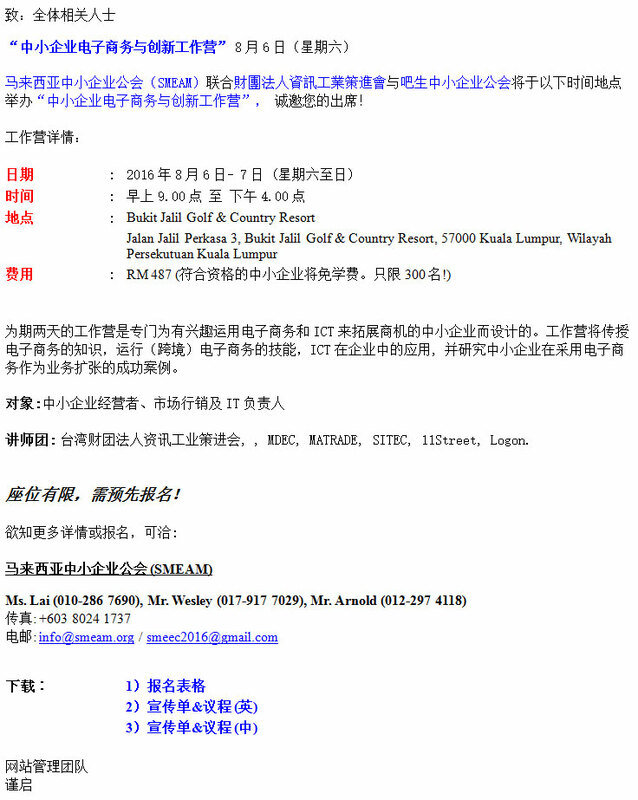 Institute for Information Industry (III) Taiwan, MDEC, MATRADE, SITEC, 11Street, Logon.